Cataracts co-management allows you to get surgical expertise from the cataract surgeon as well as extra care from our optometrists. Our optometrists will evaluate you to determine if cataract surgery is your best option. If cataracts surgery is right for you our specialized optometrists will review the process and discuss what results you should expect after your surgery. Cataracts are caused by many different factors that causes the natural lens of the eye to be cloudy, resulting in blurred vision. In a normal eye, light can pass through the clear lens onto the retina, the back of the eye. If part of this lens is opaque or cloudy, the patient experiences blurry vision – like looking through a fogged-up window. Early detection is key to a successful surgery, and the best way to achieve this is to see your eye doctor regularly. Surgery is the most effective way of improving vision in cataract patients. The process involves removing the cloudy lens and replacing it with an artificial clearer lens. The lens inserted in cataract surgery requires little to no special care after the surgery. After cataract surgery, most patients experience a quick recovery with reported better overall vision. Family Vision Center knows that everyone is different so results will vary. We specialize in cataracts co-management and will work with experienced surgeons to maximize your results. After surgery our optometrists will examine your cataracts and make sure you have optimal results. Since everyone is different results vary, but typically occur quickly and allow patients to return to daily activities almost immediately after cataracts surgery. Many patients who have cataracts surgery not only report better overall vision, but also find that colors are more brilliant. Family Vision Centers specialize in cataracts co-management and will work with an experienced cataracts surgeon to maximize your results. 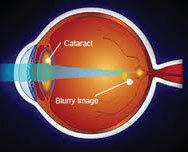 For more information on cataracts click here.